In 1986 Dr. Delia and Mark Owens entered the North Luangwa National Park (NLNP) of Zambia to study lions. 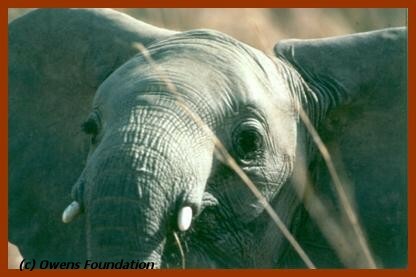 They soon found that 1,000 elephants were being killed each year and the Park would soon be sterilized. To stop the slaughter they provided boots, uniforms and transportation for government Game Scouts. They also devised a sustainable loan program to give remote villagers alternative food and income in place of poaching - all based on an understanding of the need for wildlife conservation. By 1994, not one elephant was found dead in NLNP. That same year, Zambian Hammer Simwinga joined this program and through their combined efforts, thousands of Zambians have had improved quality of life and their wildlife heritage secured. Hammer now directs development programs through his non-governmental organization, The Foundation for Wildlife and Habitat Conservation - Zambia. As a result of these on going efforts since 1986, more than 37,000 people have improved quality of life with income increased 100% over poaching days. Hammer meets with villages and their Chief to discuss new programs and saving wildlife. 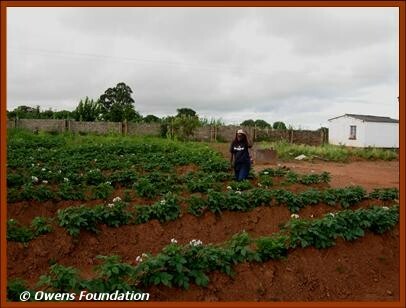 RURAL HEALTH: Since 1994, OFWC has funded the training of more than 70 Traditional Birth Attendants (TBAs) in AIDS prevention, family planning, pregnancy monitoring and delivery, hygiene, first aid, childhood development and nutrition. TBAs sometimes offer the only medical care available to remote villagers. The Foundation also coordinates the donation and shipment of medical supplies for the TBAs. More TBAs and medical supplies are needed. 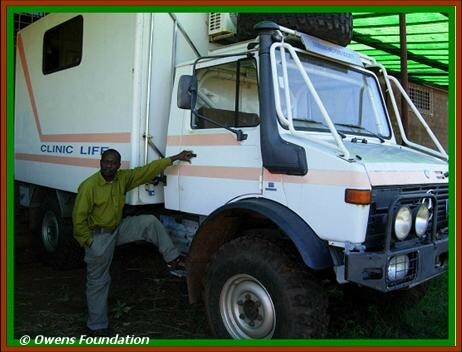 Mobile Clinic: In 2008, the OFWC funded the purchase of a heavy duty Mercedes Benz Unimog truck outfitted as a Mobile Clinic for use by Hammer's FWHC. The Clinic is equipped for surgery, laboratory, x-ray, oxygen, refrigeration and dental treatment. This very heavy duty truck will facilitate access to extremely remote villages to bring AIDS testing (formerly not available), immunization programs plus treatment for a variety of medical needs. A surgeon from the Ministry of Health plus a Registered Nurse will staff the clinic plus a rotating corps of medical and public health volunteers from the USA who will collect data on the myriad of medical challenges faced by rural Zambians. 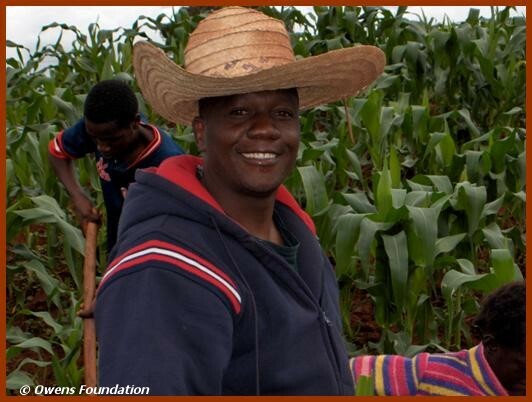 Hammer is a tropical agriculture specialist helping villages convert from slash and burn farming to sustainable, environmentally sound methods that include crop diversification that provides improved nutrition and year round food availability. Food assurance has more than doubled in project villages. Well fed people do not have to poach wildlife to survive. A village woman with her healthy crops. She is providing a home for her grandchildren as both of their parents died. A good harvest saves lives. 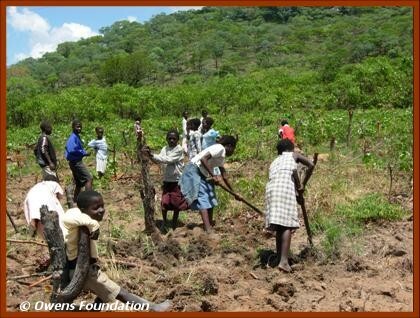 School students plant tree saplings near their village. These children will be stewards of this restored woodland and understand its importance to their lives and to the wildlife. 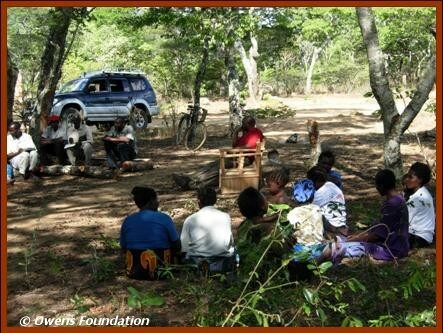 Hammer is working with a number of Chiefdoms located near the Lavushi Manda National Park (LMNP - located up on the plains west of the Muchinga Escarpment) to set aside tribal lands for forest protection and replenishment. Hammer is focusing on the Chiefdom's of Mpumba, Chiundaponde, Luchembe and Kopa - areas where wildlife has been almost poached out. With habitat restored and with protection from the Chiefs and their people, wildlife will return through historic migratory corridors from the now verdant NLNP where animals are being seen in areas where they have been absent for 50 years. Over 10,000 hectares of tribal forest land have been proposed as a nature reserve in Mpumba Chiefdom and another 5,000 hectares of forest in Chiundaponde. Hammer hopes to secure another 12,000 hectares in Chief Luchembe and Kopa. Hammer provides materials and programs for local schools and in some cases helps to build new brick schools for remote villages. Hammer is currently building a Junior Ranger Center for area students to visit during their off weeks from regular school. These boys will not be poachers. There they will study local flora and fauna and learn their role as stewards of the earth. 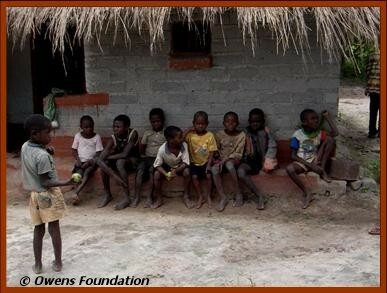 The OFWC has donated five small, durable computers for use at the Center and also facilitates a Sister School Exchange Program and the donations of school supplies for remote schools. OFWC is compiling a booklet on the mammals and birds of Zambia to be used in schools and at the Junior Ranger Center. The children of today are the environmental stewards of tomorrow. TOURISM: OFWC promotes tourism in NLNP and in the future - hopefully in LMNP in coming years - providing income for the safari operator, local people and the Zambian government. More information and tourism links. HAMMER SIMWINGA: winner of the 2007 Goldman Environmental Prize for Africa, TIME MAGAZINE'S International Edition - Environmental Hero in 2007 and the 2008 National Geographic Emerging Explorer. His Foundation has received funding from the OFWC, The Prince Bernhard Fund for Nature of The Netherlands, UK based Whitley Fund for Nature, Nikon Precision USA, South African Wildlife Heritage Organization, National Geographic Society, Save our African Wildlife Resource of Holland, among others. Additional funding is greatly needed and appreciated.